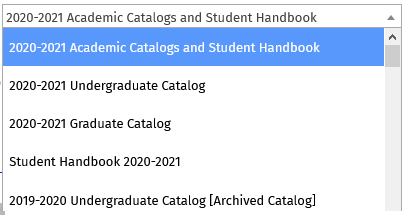 Published annually by the Office of Academic Affairs. For assistance selecting courses or a degree program, please contact your advisor. Graduate students with additional questions may contact the Graduate School. Published by the Office of the Vice President for Student Affairs. Search by course prefix, course number, exact match, or descriptive phrases. Select the desired catalog from the drop-down menu in the top right corner of the screen.